Network Rail plans to spend £5 billion on modernising the Great Western Main Line, its South Wales branch and other associated lines. The modernisation plans were announced at separate times but their development time-scales, during the second decade of the 21st century, overlap each other. The work includes electrification, resignalling, new rolling stock and station upgrades. According to Network Rail, the modernisation started in June 2010 and was due to end in 2017. The project has been subject to repeated delays, with the earliest date for full completion now estimated to be 2024. On 8 November 2016 the government announced that several major elements of the electrification program would be indefinitely deferred. At the start of the 21st century, the Great Western Main Line and the Midland Main Line were the last of the major main line routes in the UK using diesel trains as the main source of locomotive power. When the announcement was made in July 2009 to electrify the Great Western (along with the Liverpool-Manchester line), it represented the first big rail electrification project in the UK for 20 years. The South Wales Main Line branch of the GWML is set to be the first electrified cross-country railway line in Wales. 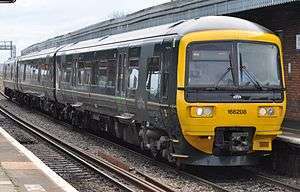 The plan to upgrade the rolling stock on the Great Western was included in the Intercity Express Programme (IEP) announced in 2007, a Department for Transport (DfT)-led initiative to replace the ageing fleet of InterCity 125 and InterCity 225 train sets currently in use on much of the UK rail network. In 2009, the only electrified portion of the Great Western was between London Paddington and Airport Junction (west of Hayes and Harlington). This portion of the Great Western is equipped with a 25 kV AC overhead system which was implemented for the Heathrow Express service. The electrification will be extended from Airport Junction to Maidenhead under the Crossrail scheme. Further electrification west of Maidenhead was announced by the DfT separately, though the electrification west of Airport Junction (to take Crossrail to Maidenhead) and west of Maidenhead is likely to be done as one scheme. The UK government first considered electrifying the Great Western between London and Bristol in a first phase, then electrifying the rest of the line between Swindon to Swansea at a later date. However, in July 2009, the Department of Transport under the then Labour Government (in the run-up to the 2010 general election), announced that there would be a £1 billion programme to electrify the whole of the Great Western from London to Swansea as well as to Bristol. The Labour government claimed that the investment would pay for itself over a 40-year period. Estimates showed that the Hitachi Super Express trains could reduce journey times from London Paddington to Swansea by 19 minutes. In an effort to minimise disruption during the electrification works, Network Rail is developing new "factory engineering trains" to facilitate the process of installing overhead lines. There will be three types of trains: the first train will be used to install pylons, followed by a train to hang the wires and finally there will be a train which will check the installation. The system is expected to be able to install 1.5 kilometres (0.93 mi) of electrification in one eight-hour shift. The vehicles are to be supplied by German firm Windhoff. In its initial survey, Network Rail identified 113 structures - mainly bridges and tunnels - which require modernisation, in subsequent surveys increased to 137. The largest structure, the Severn Tunnel, has good clearances and is relatively easy to electrify. After the 2010 UK general election in May 2010, the coalition Conservative/Liberal Democrat alliance placed all major government capital expenditure, including the Great Western electrification scheme on hold pending a return-on-investment review. In November 2010, Transport Secretary Philip Hammond gave the go-ahead for the lines from Oxford via Didcot to London and Newbury to London to be electrified in the next six years. Extension from Didcot to Swindon, Bath, Bristol and to South Wales would be dependent on a further assessment due in 2011 of the costs and implementation requirements of the Intercity Express Programme. On 1 March 2011, transport secretary Philip Hammond announced that rail electrification from Didcot Parkway to Bristol Temple Meads and Cardiff Central would go ahead. The section linking Bristol Parkway and Bristol Temple Meads would also be electrified. In March 2012 Amey plc announced it had been awarded a £700 million contract to undertake the electrification works. In July 2012, the UK Government announced that the final portion of the Great Western from Cardiff to Swansea would be electrified. In addition, as part of the Electric Spine project, the line between Reading and Basingstoke would also be electrified at 25kV AC OHL. The overhead electrification of the branches to Henley, Marlow and Windsor were also added to the scope of the project. However, the Marlow electrification has been postponed for the foreseeable future due to difficulties at Bourne End. The new NR Series 1 overhead line equipment, designed and manufactured by Furrer+Frey, is specified to allow 140 mph operation and will be installed using Amey plc's High Output Plant System (HOPS). This is designed to allow Adjacent Line Operation (ALO) where works can be carried out while trains operate on adjacent tracks. The HOPS has five sections, each of which handles a different aspect of the installation - these can be coupled together to work as one unit, or separated to work independently. The train will be maintained at the High Output Operations Base (HOOB) in Swindon, on the site of former sidings. HOPS will mix and lay 30m3 of concrete per night, and all equipment and personnel will arrive at the site on board. The HOPS train was operational by 2014, but had not reached full productivity due to teething problems. By 2015 completion of the electrification project had been delayed, reportedly 1 year behind schedule, with completion expected in 2017. Costs of the electrification were reported to have tripled from an estimated £640 million to £1.74 billion. In June 2015, the International Railway Journal reported: "Britain's secretary of state for transport, Mr Patrick McLoughlin has asked Sir Peter Hendy to review Network Rail's 2014-2019 capital investment programme, known as CP5, and report back in the autumn". The report stated that costs had tripled from the £874 million original estimate to £2.8 billion, and was £1.2 billion higher than the estimate made a year ago. The main part of the programme will go ahead as planned and should be delivered by March 2019, but the Cardiff to Swansea section will be delayed, to some time between 2019 and 2024. Revised dates for the completion of electrification work were published in early 2016, with electrification to Cardiff via Bristol Parkway, and the connection to Newbury planned by December 2018; the branch to Oxford from Didcot by June 2019; and the branch to Bristol Temple Meads from Wooton Bassett sometime between February 2019 and April 2020. In November 2016 the government announced that electrification work on the branches from Oxford to Didcot Parkway, Bristol Parkway to Bristol Temple Meads, Bath Spa to Bristol Temple Meads, and lines in Henley and Windsor area had been indefinitely deferred. Example of an existing colour light signal at Bristol Temple Meads station. ETCS "Eurobalise" transceiver, installed between rails, provides information to ETCS trains. 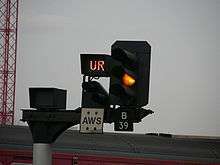 The Great Western Main Line is currently equipped with colour light signalling common to the rest of the United Kingdom. At the time of the Ladbroke Grove rail crash, the ATP (Automatic Train Protection) warning system was under trial. In response to the Ladbroke Grove crash, it became a requirement for First Great Western trains to have all their trains fitted with ATP. When the Department for Transport first released the train specification for the new trains for the Intercity Express Programme in November 2007, it was stated that the Great Western Main Line would be upgraded to ETCS level 2 and ERTMS Level 2 in-cab signalling. Some or all of the resignalling work will be carried out alongside the electrification work. Signalling Solutions is to resignal the 12 miles from Paddington to West Drayton, including the Airport branch, as part of the Crossrail project. In November 2008, Westinghouse (subsequently known as Invensys Rail, and now part of Siemens Rail Automation) was awarded a £20 million contract for a 30-month programme of signalling enabling work. Over a series of 12 commissionings, Invensys Rail will re-lock the existing Reading Station and Spur interlockings to three new WESTLOCK Interlocking units, re-control the remaining 18 relay interlockings and move signalling and telecommunications control from Reading Station to the new Thames Valley Signalling Centre at Didcot. The work culminates in a final commissioning, scheduled for 5 December 2010 and paves the way for future stages of the remodelling programme. The Thames valley signalling centre will eventually replace older signalling control in the entire English Western region. The London area is due to switch over at the end of 2011, followed by the old Slough PSB (Power Signal Box) area. Attention will then be given to abolishing Oxford, Swindon A, Bristol PSBs and the 1990s Swindon B IECC. This will be followed by the elimination of the 1980s PSBs at Westbury and Exeter, and the 1970s Plymouth PSB, the 1960s PSB at Gloucester as well as substantial semaphore signalling in Cornwall. The signalling is due to be overlaid with ERTMS control system level 2 from 2016. The first phase of a £400m, 10-year resignalling scheme in South Wales by Network Rail was carried out on a 22-mile (35 km) stretch between Port Talbot and Bridgend (termed Port Talbot East) in 2006/2007. The works provided a new turnback facility in both directions at Port Talbot Parkway if required. The renewals replaced an old British Railways Western Region NX panel installation, dating from 1963. Railway technology has evolved somewhat since 1963 and the renewals will make some signalling facilities redundant. Further signalling renewals are programmed for the Newport area (which will be implemented in two phases), Cardiff and Port Talbot West. The first phase of the Newport Area remodelling and resignalling began in 2009 and is expected to be completed by the end of 2010. The first phase covers the stretch of line between Patchway and Marshfield to the west of Newport. A new South Wales Control Centre, built on the eastern end of Canton Depot in Cardiff, opened in Spring 2009. The signals implemented in Newport Area resignalling phase 1 will be the first to have control transferred to the South Wales Control Centre and once Phase 2 of the Newport Area resignalling is complete in 2011, the Newport signalbox will be closed. Control will pass to the South Wales Control Centre for other parts of the south Wales network as resignalling progresses. Services from London Paddington to south west England and south Wales are currently served by Class 43 "InterCity 125" train sets. The Intercity 125 trains were built between 1975 and 1982 and due to their age are set to be replaced by new Hitachi Super Express train sets. The "Intercity 125" trains are one of the fastest trains on the Great Western, operating at 125 mph (201 km/h) as are all trains in the UK except those on High Speed One and the InterCity 225 trains on the ECML which are capable of 140 mph. The new Super Express trains will have a top speed of 125 mph (201 km/h) but will be capable of 140 mph (225 km/h) with minor modifications. The upgrading of the signalling on the Great Western to in-cab signalling is one pre-requisite to allow the new Super Express trains to run at 140 mph (225 km/h). In the 2010 GWML RUS Network Rail stated that linespeeds in excess of 125 mph (201 km/h) west of Reading would be "reviewed in line with electrification and resignalling opportunities as ERTMS becomes deployed across the RUS area" after Control Period 4 (2014–2019). The new Hitachi Super Express trains planned for the Great Western inter-city services will now be predominantly electric units instead of the planned diesel units. Despite the initial limit of 125 mph their increased acceleration and operational efficiency are expected to decrease the journey time from London to Bristol Temple Meads by 22 minutes. However, a proportion of the fleet will be using dual power source electro-diesel bi-mode trains, which will enable services to operate to Swansea before line electrification reaches Swansea. The bi-mode trains will allow inter-city services to operate from London directly to places in South Wales and south west England, to which electrification does not extend under the current electrification proposals, like Carmarthen, Worcester, Gloucester, Cheltenham and the regions to the south west of Bristol and Newbury. The new Super Express trains will bring about an estimated 15% increased capacity during the morning peak hours. New servicing facilities for the new fleet of Inter-City Express trains will be developed at the London North Pole Depot, the Filton Triangle rail depot in Stoke Gifford and at Maliphant sidings in Swansea. Thames Valley commuter services, from London Paddington to Reading and to Oxford are currently served by a combination of Class 165 "Network Turbo" and Class 166 "Network Express Turbo" three-car DMUs which are capable of operating at 90 mph (145 km/h). These trains will be replaced by the new 45 Class 387 four-car 110 mph (177 km/h) trains currently used on Thameslink as an interim fleet. The Class 365 Networker trains, electric versions of the class 165/166s, operated currently by Govia Thameslink Railway will not now cascade from Great Northern to the Thames Valley as originally planned. The plans were dependent on sufficient Class 700 and Class 377s, replacing 365s and 387s on the Thameslink Great Northern network. The Network Turbo/Network Express Turbo trains would then be transferred for use for services in the Bristol and South West area (see Bristol Metro scheme below). It is planned that 65 new trains are to be constructed for use on Crossrail. These will be electric multiple units and are planned to have speeds up to 90 miles per hour (140 km/h) on the surface parts of the route and up to 60 miles per hour (97 km/h) in the tunnels. It is envisaged, as part of the government's rolling stock plan, that the stock for Crossrail will be similar to the new rolling stock planned for the Thameslink Programme and will displace other types of multiple unit currently used on the Great Eastern and Great Western routes for use elsewhere on the network. Several stations along the Great Western are undergoing redevelopment or have recently been upgraded to cope with growing passenger numbers and to ease rail traffic congestion. Bristol Temple Meads will be expanded into Digby Wyatt's 1870s extension to the original train shed built by Isambard Kingdom Brunel in 1840 as the terminus for the Great Western Main Line. This part of the 'Old Station' building is currently in use as a car park, but will be remodelled as terminating platforms for services to London Paddington. To achieve rail access to the existing old platforms the Bristol power box, opened in 1970 and controlling 114 route miles of track, will need to be decommissioned and demolished. Bristol Parkway had a new third platform (Platform 4) completed in 2007 to provide a new platform for trains departing to London and Birmingham and to make services more reliable between London and south Wales. A new fourth platform is planned on the south side of the station. On 10 September 2008, Network Rail unveiled a £400 million regeneration and reconfiguration of Reading station and surrounding track incorporating an overpass system to the West of the station; with freight and passenger trains able to transit from the Reading to Taunton Line and Reading to Basingstoke Line to the 'slow' lines via an underpass beneath the 'fast' lines, replacing the conventional at-grade crossing of the 'fast' lines via points, with the aim of alleviating delays due to slow moving freight service passing through the station. By 2014 the total cost had risen to more than £800 million. As well as the reconfiguration of the track, five additional platforms have been added; the terminal platforms for services to/from London Waterloo will be altered and the Cow Lane bridge under the tracks has been made two-way and now includes a cycle path. There will be improvements that will allow the capacity for at least four extra trains in each direction every hour. London to Penzance trains were diverted to run from London Waterloo in December 2010 while a new bridge was put into position at Reading. This allowed additional tracks to be laid on the north side of the station. A new northern entrance for the station, to serve the north side of the town and Caversham, and provide a link through the station between Reading town centre and the Thames. These plans provide for the future Crossrail and possible Airtrack services at Reading station, building a railway that will be fit for at least the next thirty years. Also, the improvements will allow six new freight trains each day - this could take around 300 lorries a day off the roads. While much of the work was carried out in 2010 trains to Devon and Cornwall ran from London Waterloo instead of Paddington, using the South Western Main Line via Basingstoke then the West of England Main Line and Wessex Main Lines. Trains to Bristol, South Wales and Cheltenham were diverted via the Chiltern Main Line (from London to Banbury) where they reversed and returned via Oxford to Didcot Parkway, South Oxfordshire to re-adopt the Great Western Main Line. As of February 2015, the regeneration and modernisation of Reading Station is complete, and is now ready for the installation of overhead electric cables throughout 2015 and 2016. Reading Station now has 15 platforms each serving their own specialist destination and purpose. The new platforms allow more frequent trains to run through Reading and allow more passengers to join longer trains. Reading Station has been completed, and the entire of the Reading Redevelopment project will be completed by 2017. In 2009, an upgrade to Newport station was started to enable the station to cope with the expected passenger traffic associated with the 2010 Ryder Cup. A new passenger bridge and two new terminal buildings were constructed with each platform being served by a lift. The new bridge is clad in ethylene tetrafluoroethylene (ETFE), the material which protects the Eden Project in Cornwall, despite which the roof initially gave problems with leaking. The new development at the station includes a new multi-story car park and a new bus station will be developed outside, replacing the existing Newport bus station. The new north and south concourses opened on 13 September 2010. The development was criticised by RAIL magazine columnist Barry Doe for being at the wrong end of the station, having a leaking roof, a lack of seating and generally poor design. Extra platform capacity at Cardiff Central will be introduced in the form of a new bay platform (platform 5) for services between Cardiff and Maesteg along the GWML and one new through platform to the south of the station (platform 8) for the Cardiff urban services to cater for up to 16 trains per hour. This will bring the total number of platforms from 7 to 10. Redevelopment of Cardiff Central bus station outside the railway station commenced in 2008. Between 2009 and 2015, a new Crossrail station will be built under London Paddington, serving as a connection to National Rail services and London Underground. Services are due to start in 2018. Network Rail had planned to demolish the arched section to the north-east of Paddington station, known as Span 4. Span 4 was an extension completed in 1916 and the roof had since become dangerous. An internal blanket was erected in the 1990s to protect people from falling glass. Span 4 was to be replaced by an office block over the rails. It was later decided that Span 4 would be restored. The restoration of Span 4 took place between 2009 and 2010, and it re-opened in late 2011, looking notably brighter than the other three spans of the station. Work on modernising Port Talbot Parkway station began in Autumn 2014. The old ticket office will be demolished and a new footbridge is being built over the platforms. The footbridge will feature a new ticket office and improved accessibility to the platforms. The work is expected to be completed in Spring 2015. Severn Tunnel Junction serves as a Park and Ride station for commuters from southern Monmouthshire to Bristol, Newport and Cardiff and there is a local action group - the Severn Tunnel Action Group (STAG) - who are campaigning to enhance Severn Tunnel Junction's status as a transport hub for the southern Monmouthshire area. As of January 2010, Network Rail have remodelled the tracks around the station, re-opened Platform 4 and modernised the parking and passenger facilities. The junction where the Gloucester to Newport Line joins the South Wales Main Line has been moved west of the station and now joins the main line with high-speed turnouts. A £7.6 million modernisation of Swansea station began in 2011 and was completed in June 2012. The renovation work included enlargement of the concourse, cleaning of the front of the station with a new entrance, replacement of the partition wall between concourse and platforms with a glazed wall, a new café and more shops. Crossrail is a major rail scheme to provide a new east-west railway connection under Central London. The western portion of the line will connect with the Great Western Main Line to the west of Paddington. Current plans are for Crossrail services to terminate at Reading in the west. With electrification of the Great Western being extended westwards past Reading, the Department of Transport has stated that Crossrail will terminate at Reading from the outset. Some of the suburban services using the GWML into London Paddington will be transferred to Crossrail, which will free up some capacity at the surface level station at London Paddington. The Western Rail Access Programme is a scheme under development by the DfT, Network Rail and local authorities near Heathrow Airport to develop a direct rail link to Heathrow airport from the West. At present passengers from the West of Airport Junction need to change trains at either Hayes and Harlington or Paddington which are located to the east of Airport Junction. The proposed link will consist of a 5 km tunnel connecting a new junction between Langley and Iver stations to Terminal 5. The new link will enable direct rail services between Reading and Heathrow Airport. With the confirmed electrification of the Great Western Main line west of Airport Junction, local authorities in the Thames Valley identified a case to be made for introducing a service to Heathrow Airport from Reading via the Great Western, which would also serve Maidenhead and Slough. On 12 July 2012 Transport Secretary Justine Greening announced that a new rail link connecting Slough and Heathrow had been given the go-ahead and would be operational by 2021. Heathrow Airtrack was a proposed new service by Heathrow Airport's operator BAA. If the proposals had been realised Heathrow Airtrack would have mostly used existing railway lines which would have connected Heathrow Terminal 5 with Reading station via a southerly route on the disused southern portion of the former West Drayton to Staines railway line. The scheme would have also provided direct services to Guildford and London Waterloo. However, the Heathrow Airtrack scheme faced opposition in several of the settlements which trains would cross (see main article for more details and references). Many objections were because the line has many level crossings on main roads and the effect that additional trains would have on road congestion. This Greater Bristol Metro is a project to improve the rail services in Greater Bristol. It was first proposed at First Great Western's Stakeholder Event in March 2008. On 5 July 2012, the UK government and councils in and around Bristol agreed a City Deal whereby Bristol would have more funding for investment in the area. As a result of the City Deal, around £100M is expected to be invested in rail services under the Greater Bristol Metro scheme. 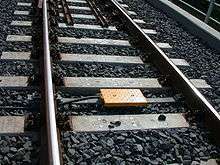 As part of the work, the Cross Country Route between Bristol Parkway and Bristol Temple Meads, commonly known as Filton Bank, will be expanded from two to four tracks. The South Wales Metro is a proposed integration of heavy rail (South Wales Main Line and Valley Lines) and development of light rail and bus-based public transport services and systems in South East Wales around the hub of Cardiff Central. The first phase was approved for development in October 2013. The Golden Valley Line serves as a diversionary line for several other lines in the area as well as serving its normal traffic. It will be a major diversionary route during the electrification of the Great Western Main Line. The line between Swindon and Kemble was reduced to a single track in 1968, limiting its capacity. On 23 March 2011 in his Budget Speech the Chancellor of the Exchequer, George Osborne, approved a project to re-double this section of line, after several years of campaigning by local politicians. The scheme was completed in August 2014. During his announcement on the Great Western electrification on 1 March 2011, transport secretary Phillip Hammond stated that a good business case existed for the electrication of several south Wales commuter lines. In July 2012, the UK Government announced that the south Wales commuter lines would be electrified. The lines which would be electrified are: all Valleys & Cardiff Local Routes, the Ebbw Valley Railway and the Maesteg Line. Some press reports state that passengers face six years of disruption from the electrification work. Over 100 bridges and tunnels require demolition or modification to accommodate the new overhead lines. The Goring Gap Railway Action Group (formed in March 2015) has complained that there has been insufficient consultation between Network Rail and residents of Goring-on-Thames about the visual impact of the overhead line supports. The announcement of electrification of the Great Western led to the Government changing their plans to purchase a new fleet of diesel trains consisting of 202 locomotives and 1,300 train carriages. The RMT union called for assurances that the plans will not have an adverse impact on jobs at the UK's only train maker Bombardier. In February 2010, it was announced that the Intercity Express Programme (for long distance express services) was suspended pending an independent report, with a decision on its viability to be given after the 2010 UK general election. In 2012 the contract to provide Intercity Express bi-mode trains was awarded to Hitachi. Chippenham-Bath Bath Track Level Complete 2015 To clear Sydney Gardens bridges, Bath. Bath-Bristol Bellotts overbridge Bridge Started 2016 Sep Demolished, yet to be rebuilt. AKA Somerset & Dorset Intersect Bridge. Part of the Two Tunnels cycleway. Bath-Bristol Keynsham overbridge Track Level revised to be done 2018 2016 Apr Clearance. Bristol Temple Meads Royal Mail Conveyor Removal Complete N/K Clearance. Lawrence Hill-Filton Abbey Wood Midland Railway Bridge Overbridge Complete 2016 May Protect public from cables. The higher bridge sides now have a mural. 1 2 "Great Western electrification: Intercity line work 'deferred'". BBC News. 8 November 2016. Retrieved 10 November 2016. ↑ "£1.1bn investment to electrify rail". shares.ie:. Archived from the original on 21 July 2011. ↑ Network Rail 2011, pp. 9,13. ↑ "Chance to make public transport attractive". Wales Online. 12 August 2009. 1 2 "£1bn plan to electrify rail line". BBC News. 23 July 2009. ↑ "Electrified rail network: the benefits". The Daily Telegraph. 23 July 2009. 1 2 "'Minimum rail disruption' pledged". BBC News. 23 July 2009. ↑ "Windhoff to build Network Rail's electrification factory train". Railway Gazette International. 5 December 2011. 1 2 Peter Dearman (28 April 2011). "Electrification: delivering the transformation". Global Rail News. Retrieved 10 March 2014. ↑ "Electrification must passcost test before go-ahead – Cameron". ThisIsBristol.co.uk. Archived from the original on 25 April 2010. Retrieved 1 April 2012. ↑ "Railways to get £8bn investment". BBC News. 25 November 2010. Archived from the original on 26 November 2010. Retrieved 1 April 2012. ↑ "Great Western electrification and IEP to go ahead". Cardiff News. 7 May 2011. Retrieved 1 April 2012. ↑ "Amey awarded Great Western electrification contract". Railway Gazette International. 27 March 2012. ↑ Woodman, Peter (16 July 2012). "£4.2bn of new rail schemes unveiled". The Independent. Retrieved 1 December 2015. ↑ "HOPS & HOOB". Hub. Amey plc: 10. April 2014. ↑ "'Whenever you introduce a new technology, there is a learning curve'". www.railtechnologymagazine.com. 1 September 2014. Retrieved 8 April 2015. ↑ "Great Western electrification scheme 'one year behind schedule". BBC News. 24 February 2015. Retrieved 8 April 2015. ↑ Briginshaw, David (25 June 2015). "New Network Rail chairman to review troubled investment plan". International Railway Journal. Retrieved 1 December 2015. ↑ Tanya Powley, Gill Plimmer (25 November 2015). "Rail upgrade needs extra £2.5bn". Financial Times. Retrieved 14 December 2015. ↑ "Rail electrification between Cardiff and Swansea delayed". BBC. 25 November 2015. Retrieved 14 December 2015. ↑ "Driver blamed for Southall crash". BBC News. 24 February 2000. ↑ "Network Rail Train Infrastructure Interface Specification" (PDF). Department for Transport. ↑ "World infrastructure market November 2008". Railway Gazette International. 20 November 2008. ↑ "Westinghouse awarded Reading Contract". Invensys Rail. 21 October 2008. Retrieved 1 April 2012. ↑ "NR rail control centres article". Rail News. Archived from the original on 24 July 2011. ↑ "Hammond launches £5bn Great Western Main Line upgrade". Railway Gazette International. 14 July 2011. ↑ "Wales RUS 2008" (PDF). Network Rail. p. 55. 1 2 "South Wales - £400 Million of Signalling Investment". RailwayPeople.com. 1 2 3 "Severn Tunnel Junction: From sleepy halt to centre of high-speed city connections". Rail News. 4 February 2009. Retrieved 1 December 2015. ↑ "Great Western Route Utilisation Strategy" (PDF). Network Rail. March 2010. ↑ "Inter-city electrification planning to start immediately". Railway Gazette International. 23 July 2009. ↑ "Britain's Transport Infrastructure - Rail Electrification" (PDF). Department for Transport. ↑ "Rolling Stock Plan". Department for Transport. 30 January 2008. Archived from the original on 5 June 2008. ↑ "Temple Meads (old) station". Engineering Timelines. Retrieved 1 April 2012. ↑ "Brunel's Passenger Shed to be used for Bristol to London electric line". This is Bristol. 29 March 2012. Retrieved 1 April 2012. ↑ "Bristol museum could revert to rail platform". BBC. 28 March 2012. Retrieved 1 April 2012. ↑ "Bristol Railway Archive, Bristol Powerbox". Bristol Railway Archive. Retrieved 9 May 2012. ↑ "Bristol Parkway Platform 4". Network Rail. Archived from the original on 15 December 2007. Retrieved 1 April 2012. ↑ "Network Rail Route Plans 2009: Route 13 - Great Western Main Line" (pdf). networkrail.co.uk. Retrieved 1 April 2012. ↑ "Station's £400m revamp unveiled". BBC News Berkshire. Retrieved 1 April 2012. ↑ "Reading station area redevelopment". Network Rail. ↑ "'Lasting benefits' from £22m Newport station upgrade". Archived from the original on 17 September 2010. Retrieved 1 April 2012. ↑ Doe, Barry (4 May 2011). "The Fare Dealer". RAIL. Bauer Media (668): 51. ↑ "Orders of the Day — Crossrail Bill". TheyWorkForYou.com. 19 July 2005. Retrieved 1 April 2012. ↑ "London Crossrail gets the go-ahead". Railway Gazette International. 5 October 2007. ↑ "Paddington Span Four saved". Sapling.info. Retrieved 1 April 2012. ↑ "Paddington - Station roof restoration project". Network Rail. 27 February 2010. Archived from the original on 19 November 2009. Retrieved 1 April 2012. ↑ "Multi-million refurbishment scheme at Port Talbot Parkway visited by AM and MP". South Wales Evening Post. 17 November 2014. Retrieved 1 December 2015. ↑ "STAG - Severn Tunnel Action Group". saveseverntunnel.co.uk. Retrieved 1 April 2012. ↑ "Transformation of Swansea station unveiled" (Press release). Network Rail. 8 February 2010. Retrieved 1 April 2012. ↑ "£500m Heathrow link to cut times on Great Western line". BBC. 12 July 2012. Retrieved 13 July 2012. ↑ Ribbeck, Michael (6 July 2012). "£100 million Bristol Metro train network by 2016". The Post, Bristol. Northcliffe Media. Retrieved 6 July 2012. ↑ "Green light for long-awaited rail improvements". Bristol Evening Post. Northcliffe Media. 17 July 2012. Retrieved 18 July 2012. ↑ "Plans show the potential of metro network". ITV Wales. 11 October 2013. Retrieved 11 November 2013. ↑ "Chancellor approves Kemble to Swindon railway upgrade". BBC News Gloucestershire. 23 March 2011. Retrieved 1 April 2012. ↑ "Intercity Express and Rail Electrification". Department for Transport. 1 March 2011. Retrieved 1 December 2015. ↑ "Rail electrification to Swansea and south Wales valleys welcomed". BBC News. 16 July 2012. Retrieved 1 December 2015. ↑ "Six years of disruption under £1bn upgrade of Great Western Mainline". Times Online. (subscription required (help)). ↑ "About the Railway Action Group (RAG)". Save the Goring Gap. Retrieved 1 December 2015. ↑ "Rolling stock strategy torn up for electrification". Transport Briefing. ↑ Robert Lea (27 February 2010). "Plans for new intercity fleet hit the buffers". The Times. Archived from the original on 11 June 2011. Retrieved 1 April 2012. ↑ "Intercity train upgrade postponed until after election". BBC News. 26 February 2010. Retrieved 1 April 2012.